The Society for Industrial and Applied Mathematics is proud to award Lek-Heng Lim, University of Chicago, with the James H. Wilkinson Prize in Numerical Analysis and Scientific Computing in 2017. This prize, established in 1979, is given for research in, or other contributions to, numerical analysis and scientific computing during the six years preceding the award. The purpose of the prize is to stimulate younger contributors and to help them in their careers. The prize was awarded at the 2017 SIAM Annual Meeting in July. Lim's work is directly impacting the public through real-world applications. "In joint work with Thomas Schultz, an exceptionally talented computer/neuroscientist in Bonn, we figured out a way to get high-resolution 3D images of neural fibers in the human brain from diffusion MRI measurements," Lim says. 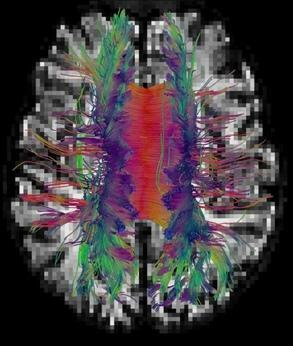 "Among other things, mapping major bundles of neural fibers in the human brain is vitally important in neurosurgical planning and is an integral component of the Human Connectome Project." Lek-Heng Lim's research focuses on tensors and their coordinate representations, hypermatrices. He is particularly interested in hypermatrix equivalents of various matrix notions, their mathematical and computational properties, and their applications to science and engineering. He is also generally interested in applied/computational algebraic/differential geometry/topology (all possible combinations). Lek-Heng was educated at Stanford, Cambridge, Cornell, and the National University of Singapore. He was a Morrey Assistant Professor at Berkeley and thereafter an Assistant Professor at Chicago. He serves on the editorial boards of Linear Algebra and its Applications and Linear and Multilinear Algebra. He has received an AFOSR Young Investigator Award, a DARPA Young Faculty Award, an NSF Faculty Early Career Award, and, more recently, a Smale Prize from the FoCM Society and a Director's Fellowship from DARPA.